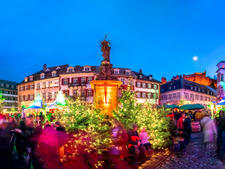 The capital of Alsace, France's smallest region, is also known as the principal city of Europe because it's the official seat of European Parliament and home to important institutions like the European Court of Human Rights, but there's much more to Strasbourg than politics and officials in gray suits. While the city reigns as a political powerhouse, it also represents a perfect blend of cultures. Built along the Rhine and located close to trading routes, Strasbourg borders Germany and Switzerland in the northeast of France and possesses a unique cultural and architectural heritage. 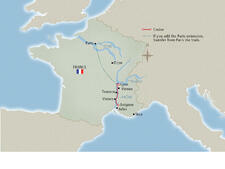 Even dedicated Francophiles are often surprised how different the city is from the rest of the France. Once part of Germany, it offers the "best of both worlds," a combination that's most deliciously illustrated in its cuisine, which reflects a happy marriage of French flair and German heartiness. With a history stretching back over 2,000 years, an obvious first stop for cruisers is Grande-Ile, the city's UNESCO-listed Old Town center. Visitors can admire Strasbourg's landmark lopsided cathedral, the beautiful Petite France neighborhood and the gateway to river cruises and streets chock-a-block with half-timbered Renaissance buildings. Many churches also went up in the Middle Ages, including Saint-Etienne, dating to the 12th century, and Saint-Thomas, which was built between the 12th and 14th centuries and ranks as the largest in size after the Strasbourg Cathedral. Strasbourg is a town made for walking, but energetic visitors can also turn to pedal power and hop on a bike like the locals. Even the most haphazard stroll will take you past a wealth of well-preserved buildings, luxury shops and designer boutiques. More affordable buys can be found in Rue des Grandes Arcades, which is Strasbourg's main shopping area and features a variety of clothing stores. River cruise vessels dock at Quai des Belges, about 1.8 miles from the city center. The docking area is adjacent to an industrial park and main road, and there are no ATM's, restaurants or shops close by. Cruisers who prefer to stay onboard their vessels can stretch their legs with a stroll along the riverbank that serves as a mooring place for large ships and pleasure crafts. The city has a comprehensive network of flat, well-marked cycle paths, but jay-walking visitors distracted by the surrounding sights can pose a hazard when they meander in front of oncoming cyclists. So look carefully before you cross. On Foot: Almost the entire center of Strasbourg is vehicle-free, and it's a city made for walking. The three-day Strasbourg Pass, priced around 14 euros, includes a guided walking tour, bike hire, boat trip and free and discounted entry to selected museums. By Bus and Tram: The city has 29 bus routes and five tram lines serving Strasbourg and the surrounding area. A leaflet for visitors showing the different lines and the buses and trams to take to reach all the main sights and attractions is available from the tourist office. One ticket can be used for both forms of transport and it can be cost effective to buy a 24-hour pass offering unlimited travel. The tourist minitram runs on a 40-minute roundtrip through the historic district and Petite France from Place du Chateau by the cathedral. 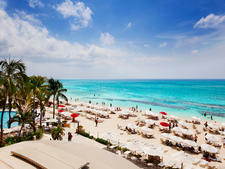 It operates daily from March 17 to November 6. 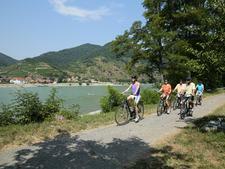 By Bike: Join the locals and explore France's largest bike trail network, which stretches nearly 310 miles. The marked trails run through the historic town center, along canals and through parks and gardens. Velhop offers bikes for rent that can be picked up and returned at 11 automatic stations around the city. Visitors must be at least 16 years old to use the bike rental service. By Taxi: Numerous taxi companies operate in Strasbourg. One of the largest is Taxi 13, which operates round the clock. Taxis can be found at the train station, airport and Place de l'Homme de Fer. Many taxis accept payment by credit card, and tipping is not expected. The currency in France is the euro. For current currency-conversion figures visit www.oanda.com or www.xe.com. ATM's are plentiful within the city center and close to Gutenberg Square. All major credit cards are accepted in shops, restaurants and cafes. Many taxis also take payment by credit card, but check first. When out and about in this cosmopolitan city, you can tune in to more than 20 languages spoken by citizens of the member states of the European Parliament. French is the official language, but English is spoken virtually everywhere. 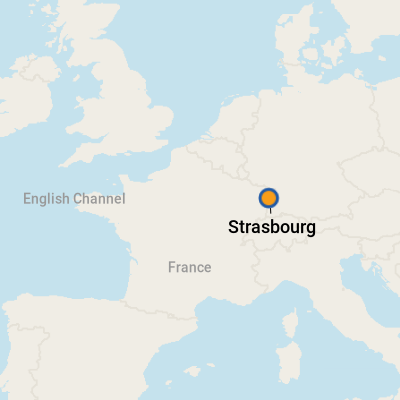 Strasbourg features plenty of international restaurants and familiar chains. But to get a real flavour of Alsace, head to a "winstub," Strasbourg's small family owned restaurants. Make sure you're hungry because the local cuisine combines the best of France's world famous gastronomy coupled with the robustness of German food. Don't forget the excellent local wine and beer. Sauerkraut is a specialty. Not simply the "sour cabbage" dish typically associated with the name, this regional version is a carnivorous feast piled high with assorted meats like local sausage, ham hock and pork chops. In fact, many meals feature at least three types of meat, poultry or fish. A culinary institution not to be missed is tarte flambee, the northern French equivalent of pizza. With various cheese, meat and vegetable toppings on a thin dough base, it's an ideal meal for sharing. And try to leave room for kougelhopf, sweet bread pudding laced with raspberry brandy. Locally made glasses and pottery -- packed carefully to take home -- loom large in many shops. Or you can choose from tablecloths, decorative items and linen goods with the distinctive kelsch, the regional pattern featuring checks or blue and red stripes. On the gourmet front, crisp Alsatian white wines, tangy Muenster cheese and pate de foie gras are typical flavors of the region and make popular edible mementos.